Have a question about our services or information about marine construction in general? Take a look below at our FAQ's section, we might have an answer to your inquiry. Q: What is the first step in permitting or making changes to a dock? 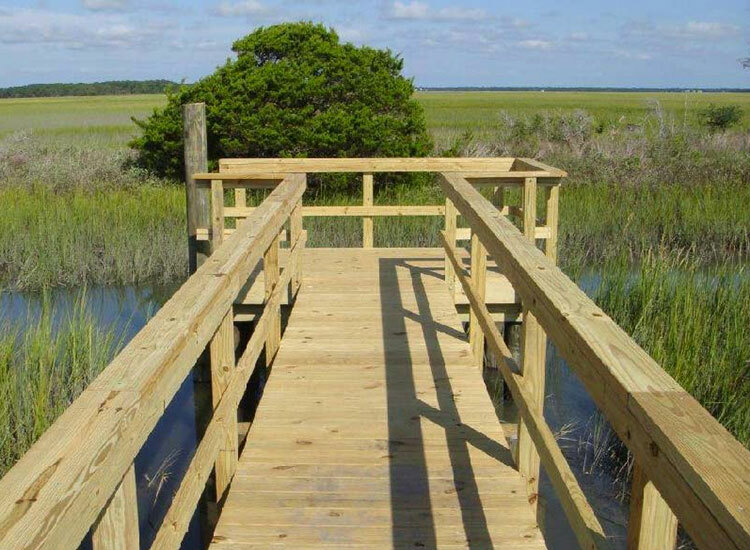 All new construction of docks and additions to docks in the critical area of our marshes requires a permit from OCRM (Ocean & Coastal Resource Management – a division of SC DHEC) and a survey showing the proposed structure, produced by a licensed SC surveyor, engineer or landscape architect. Permitting in some areas may also require a joint permit with OCRM and the Army Corps of Engineers. American Dock and Marine works closely with state and federal agencies and several surveyors to assure your docks meets required rules and regulations for permit applications. Permit regulations also call for an as-built survey to be submitted before expiration of the construction placard. There are varied answers to this question, depending on what is needed for your specific project. 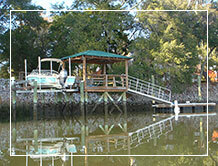 From beginning to finish the general time frame for a private, residential dock is approximately 90 days. This depends on the schedules of the surveyors, our office, public notices and OCRM requirements. Q: How long is my permit good for? A permit is good for five years from the date of issue. Q: Does repair work require a permit? Not a permit, but a letter of maintenance and repair must be obtained from OCRM. There is no cost for this letter, but an OCRM request form must be completed explaining the proposed repair and pictures must be submitted. We can assist with this requirement. Q: What is the largest dock I can have? 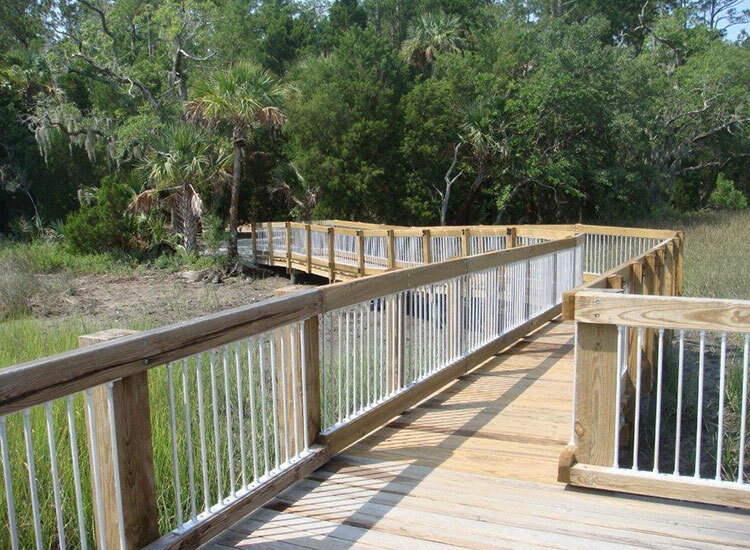 The allowed square footage of the structure is determined by creek width as measured from marsh to marsh vegetation on each side. The longest dock allowed is 1,000 feet. 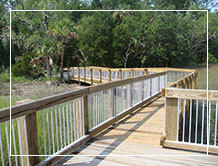 Large dock structures of 600 square feet and more may be allowed when certain criteria exists. This will be dependent on extended property lines, offsets and other criteria. We can help you in determining what you may be able to build. Q: Can I make additions to my dock without a permit? No. All additions require permits or amendments to active permits prior to making additions to a dock or changes to what has been permitted. Some changes will require a new survey. 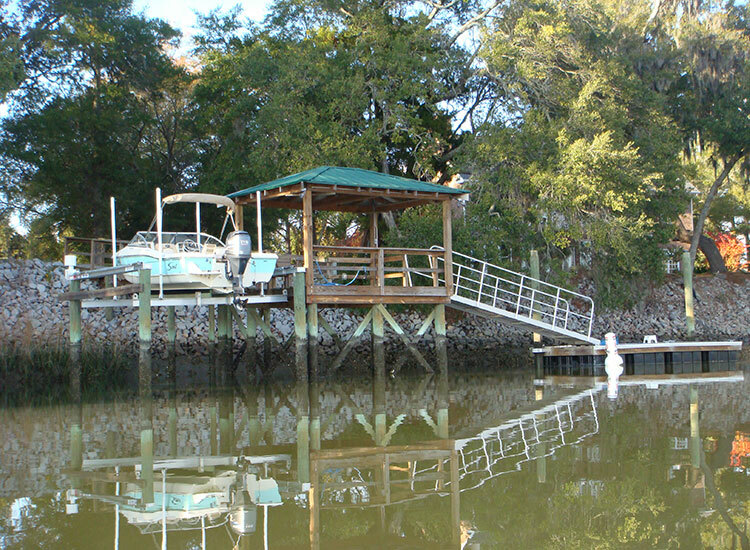 Q: Is it necessary to have a licensed contractor construct a dock? YES!! In fact, if work exceeds $5,000 only a licensed marine contractor can legally bid your project. The work must be performed by a contractor with a marine construction stipulation to their contractor's license. Construction performed by anyone (other than the home owner) without a license may cause you to be fined and require removal of the dock. 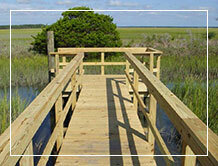 All licensed contractors should be able to present you with a copy of their South Carolina license. 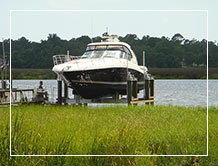 American Dock and Marine is fully licensed, bonded and insured in the state of South Carolina. Q: Do you build the dock from the water? No. We use land-based equipment to deliver materials and begin construction, working toward the water. The final deep water work is performed from barges with pile driving equipment. Q: How do I know what size boatlift I need? Boat lift size is measured by lifting capacity and length and beam of the boat. Weight is determined by boat weight, fuel, motors and gear. 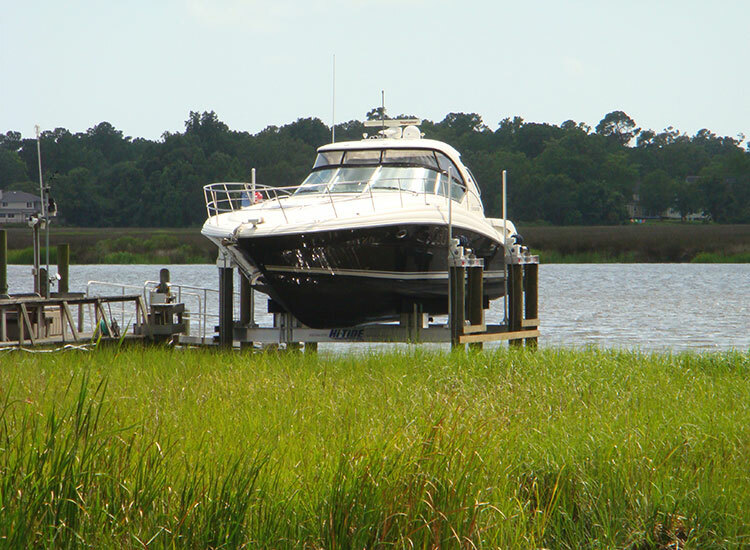 In the Charleston area on deep water, we have installed many four pile 9,000# lifts which will pick up about a 26' boat. The 12'x12' pile spread, which fits the current OCRM rule for boatlift of 160Sfalso allows for a 12,000# lift which will pick up most boats up to about 33'. Smaller tidal creeks usually call for installation of a single pile 3,000# or 5,000# lift. These lifts can pick up 18' to 20 boats, less that 8' in breadth.